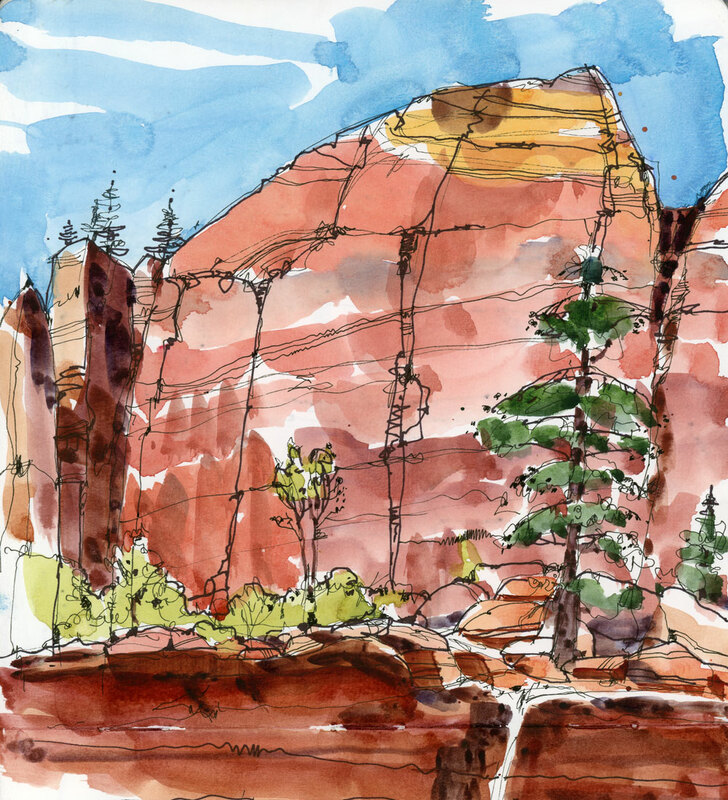 I sketched so much this summer that I am still finding things I haven’t posted — like this sketch of the lower Emerald Pool at Zion National Park in Utah. What makes Zion unique among the Utah parks is it’s lushness. When you climb the trail towards the pools, you walk under waterfalls (which I imagine are quite wonderful in the spring but are reduced to no more than a trickle in late summer) and through hanging gardens of moss and ferns. I never made it up to the other pools (that’s what happens when you stop to sketch) but I can see why this is one of the most popular trails in the park. was SOOO good to see you today; and to see all your masterpieces . and your sketches!!! Francine, it was wonderful to see you too. It was thanks to you that I found these unposted sketches, so I had to post one of them even though I am so tired I can hardly speak. It was a great weekend! Mary, it just would not have been the same if I hadn’t seen you. It was great to catch up and I’m so glad you made it. I look forward to seeing the photo and seeing you again soon too. I like the sketch. But I am failing to see the emerald pools? Of course… how stupid of me… there are the emerald pools, staring me in the face. Thanks! Yes, there are more that I had forgotten about. I brought my sketchbooks to the outdoor art show I was in on the weekend and as some people were flipping through them we spotted a bunch of unpublished sketches. So more to come! Beautiful sketch – I love this drawing style. Your under drawing in ink is so instructional. Thanks. Love the composition, too. Very nice line work in this sketch! Love this sketch and love this place. It’s near where I bumped into Marina form Israel, wet sketchbook in hand… my first Urban Sketcher meeting in real life!